DAVID LEVITHAN is a children's book editor in New York City, and the author of several books for young adults, including Boy Meets Boy, Love Is the Higher Law, and Every Day. He coauthored Will Grayson, Will Grayson with John Green, and Nick & Norah's Infinite Playlist and Dash & Lily's Book of Dares with Rachel Cohn. "Author David Levithan's poignant novel follows the stories of gay teens joined through an unconventional protest. A-"
"Over the years, Levithan has consistently explored new creative territory...'Two Boys Kissing' reveals his command of an intriguing, complex narrative with an unusual point of view: the first-person plural. This 'we' is the combined voice of men who died during the AIDS pandemic several decades ago. As the boys’ stories become more closely entwined and connect in a satisfying finale, the reflections of these 'shadow uncles' lend a quality of retrospection that is rare (and refreshing) in YA literature." "Open, frank and ultimately optimistic." "'Two Boys Kissing’ couldn’t have arrived at a more timely moment, just months after the Supreme Court decision on gay marriage. The shift in society’s attitudes towards the LGBT community has long been embraced by many in the young adult crowd. Levithan seems to intuitively understand this generation—and his new book allows him to bring their particular struggles and joys to life." "We stand on the shoulders of those who came before us, goes an oft-paraphrased line. 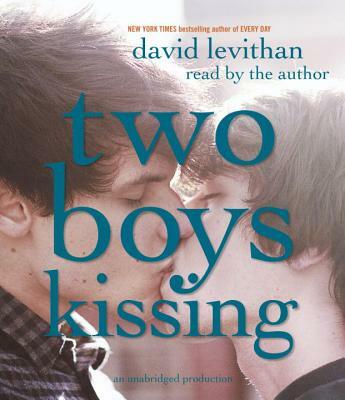 David Levithan gives vivid voice to it in his latest YA novel, 'Two Boys Kissing'. "Levithan’s powerful, multifaceted novel explores just how far things have come for many gay teens—and how far things still need to go." "A landmark achievement from a writer and editor who has helped create, in literature, a haven for queer youth." "No one does heart-pulling emotion like Levithan, and this book, coming a decade after his groundbreaking debut, 'Boy Meets Boy,' has special resonance." "Brilliant, moving, important, and wise." "Two Boys Kissing will make you laugh and cry, but best of all, it will make you relive those perfect innocuous moments of finding and then being with your first love." "Thought provoking, poignant and beautifully written, above all this is an unbelievably important book for anyone who has struggled with identity, love and loss. The omniscient narration is incredibly moving and appreciative of the fragility of life. A groundbreaking addition to the LGBT genre and community." "The novel has genuine moments of insight and wisdom...Inspiring." "Two Boys Kissing by David Levithan takes the stories of all these boys and spins them into an interconnecting web that will leave you emotionally exhausted and absolutely thrilled to have read something so beautiful and unique...Will educate, entertain and move you." "Levithan takes contemporary to a whole new space with this novel, finding new ground in storytelling around important issues that directly affect teens today." "Levithan leans intensely into this work...There’s little doubt that this title, with its weight, significance, and literary quality, will find its way into LGBTQ and wider cannons. Stock up." "The story will engage readers, both female and male." "The high level of imaginative and intuitive empathy that is apparent in all of his works is especially strong here—as not only are his protagonists fully realized, but so are the voices of the collective narration, whose experiences are as varied as the characters on the page... It is the best book I have read this year." - Maggie Tokuda-Hall, Books Inc.
"Everyone needs to read this, not just YA. How perfectly David puts the past, present and future into one small novel. Now, as soon as my eyes stop watering and the goose bumps on my arms go away, I can continue my day." "Levithan's choice of narrator was inspiring and heartbreaking. Giving a voice to that generation and exposing young kids to those voices, blew me away...Two Boys Kissing feels like a very important book, something I think everyone should read and something that's touched me in a way no YA has in a really long time."